IF you can identify Leonardo’s famous 15th century mural painting as “The Last Supper”, you are on your way to passing level 1 of a new Catholic Bible Trivia app designed by an Australian Dominican Friar. 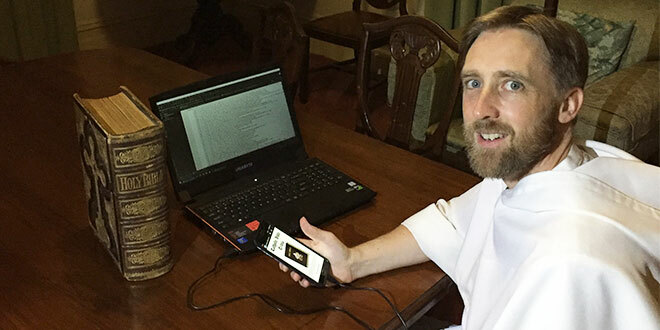 The app is the brainchild of Dominican Father Matthew Boland and a number of his fellow Dominicans as a sequel to the highly successful Catholic Trivia (CT), which they designed and released two years ago. However, with about 1200 Bible questions, even the sharpest scripture minds will find it challenging to reach and conquer level 7. “You’ll find the answer to these questions in scripture, although they are not ones most of us would know,” Fr Boland said. “(It’s) probably good to have the Bible handy. It’s a learning process, not just a testing process. A few years ago, while still studying for the priesthood with the Order of Preachers, Fr Boland, now 41 and a self-declared technology geek, taught himself programming skills by enrolling in a free HarvardX online computer science course. He combined his IT skills with a love of scripture and promoting the faith, passions he shared with fellow friar students. They spent their spare time developing questions that formed the basis for Catholic Trivia, that has now been installed by about 25,000 players. Fr Boland said the online world was now ready for Catholic Bible Trivia. “I’ve learnt so much doing it. I hope when people play it they are intrigued and have a renewed interest in the Word of God,” he said. There are some creative and amusing features built into Catholic Bible Trivia. There is a leader board to fire up competitive juices. And when a player completes a level, the app plays an uplifting and soothing Dominican chant recording, some of which are recorded by the Australian Dominicans themselves. When a player “dies”, the app plays the Dominican chant “Miserere Mei” (Have Mercy on Me). After reaching level 7 and answering all questions correctly, players can, for a small price, order a certificate signed by Fr Boland. “We have sent many (certificates) around the world for Catholic Trivia, and now I hope to send many more,” he said. “I’m also planning to add new questions as well. I changed the design of the program so it’s more flexible. Both Catholic Trivia and Catholic Bible Trivia are released on the Android platform. Fr Boland has set himself a challenge of developing the apps for IOS, the Apple operating system. “We’re working on that, but I’m not sure how long it will be before we have an iPhone version,” he said. Find the games at the Google Play store.